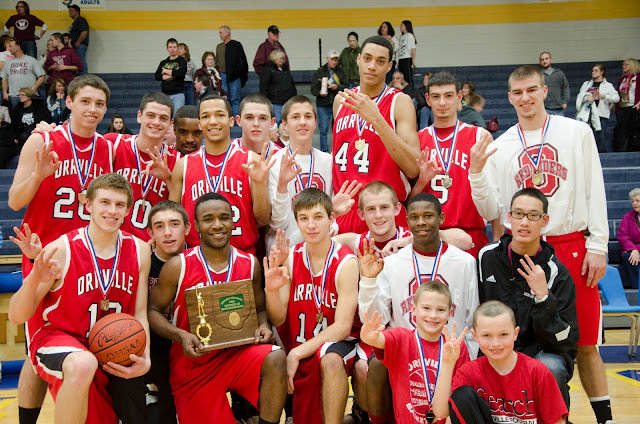 Orrville Red Rider Sports Blog: District Champs Again. Fieldhouse Bound!! District Champs Again. Fieldhouse Bound!! Thanks to Mike Guster for the picture. Great work, Mike. Well, here we are again. District Champs for the 3rd straight year after a 61-51 win over the Wellington Dukes. The Riders advance to play the Burton Berkshire Badgers in a regional semifinal game at the famed Canton Memorial Fieldhouse this coming Wednesday at 8:00pm. If you can believe it...the Red Riders are one win away from playing for a return trip to Columbus. I'd say it defies logic, but we've seen this exact same scenario for 3 years in a row...and the last 2 years have seen the Riders finish the regular season with an identical 7-13 record only to prove that scheduling matters...a lot...and fight their way through districts. Let's talk about how we got here, and look ahead to what's next. The other half of the Canton region won't be set until tomorrow night, as Bedford St. Peter Chanel (20-3) will take on Beachwood (14-8) with the winner advancing to play New Middletown Springfield (21-2). Chanel is ranked 14th in the Cleveland.com High School poll, so I'd be surprised if they weren't waiting in the regional final for either Orrville or Berkshire. When this tournament started, I thought the 6-seed was fair, but still a slap in the face considered the level of talent we faced during the season. My thought was that if our schedule did indeed set us apart from the other 13 teams in the district, then it should matter what we were seeded...and turns out, it didn't. After dispatching of Chippewa, the Riders beat #4 seed 17-win Loudonville, #2 seed 17-win Hillsdale and #3 seed 19-win Wellington. That's 3 wins over 3 of the top 4 seeds with 53 combined wins. That's why we say "scheduling matters"....because it does. No team played the kind of in and out-of conference that we did, and it showed. This is the payoff for when the season started so roughly. Remember, we started 1-8. Since then we're 10-5 and district champs. I'm pretty certain that at no time in the history of Orrville basketball has a team won three straight district titles. We've won two a few times, but not even in our dominants years in the 80's & 90's can any coach or team claim what Coach Slaughter and the Riders of the last 3 years can claim. It's quite an accomplishment when you think about it. Speaking of Coach Sly...he asked me after the game if there has ever been a Red Rider who can say they won 3 district titles during their years at Orrville. I think I know that nobody except this years seniors (Drew, Devon, AJ & Jordan) can say they were part of 3 in a row...but has there been others who can say they won 3 in their years at OHS? If there are, it's maybe one or two. The two names mentioned as a possibility were Ron Wachtel and Ralph Winters. Wachtel led his team in scoring in 1977-78, 1978-79 and 1979-80 and but the 1978-79 team was 18-3 that year, only 21 games. Even if they only played 19 games like they did in the 70's, I can't see that being a district title season. Ralph Winters was close. He was on the 1979-80 team that went to state, and then led the team in scoring in 1980-81 and 1981-82, with the 80-81 team winning districts, but the 81-82 team lost to Akron St. V. in the district final. UPDATE: I'm not sure why I didn't think of this last night, but there are 2 names that obviously won 3 district titles....Marcell Denson & Renauld Ray. Both played as freshmen in 1992-93 when the Riders won districts and advanced to the regional finals & both were obviously the key players in the back to back title teams in 1994-95 & 95-96. It wasn't 3 straight, but it was 3 total. Thanks to a commenter for pointing that out. So unless I'm told different, we need to congratulate Drew Brenner, Devon Winters, AJ Perez and Jordan Ray for being the first 4 Red Riders to win 3 straight district titles. Great accomplishment guys. That same group of 4 has also been part of 16 tournament games in the last 3 years, with 14 of those being wins. I've mentioned this on twitter a few times (Have I mentioned Twitter before? ), but in tournament play, Orrville is unbeaten on the floor of Wooster High School. We first started playing there in 1994-95 when the school opened, and won the first 2 games of the tournament that year. The district final that year (against Norwayne) was moved to the Canton Fieldhouse. The in 1995-96, we moved up to Division 2 where we stayed until returning to Division 3 in 2009-10. We won 2 more games at WHS that year, again with the district final against Triway being moved to the College of Wooster. Then last year we won all 4 tournament games at WHS, claiming our 2nd straight district title, then 4 more at WHS this year. So that's 12-0 on the floor of Wooster High School in tournament play. Again...impressive. Before the next to last home game of the season, I spoke with Drew's dad Tom Brenner. I asked if Drew was looking forward to track season and getting back to state in the hurdles. I wasn't necessarily writing off basketball season, just asking about track...Tom's response to me was "Yeah, he's looking forward to track, but he thinks we've got a deep run to make in basketball first." I'd say this counts as a deep run...and his 30-point performance against Wellington was Drew doing what Drew does, but also doing what a senior captain does. When we had some early frustration, there was Drew settling down his teammates, when a big bucket was needed, there he was....and when crucial foul shots were needed, Drew (and the rest of the team) knocked them down. Again, it's just what a senior does, but he and the rest of his senior teammates are making another run for the memory books. What more can you say about Coach Slaughter & his staff. They keep these kids working hard and have them playing their best ball at exactly the right time. I like the rotation of guys and bringing Joel Zook and Stu Turner off the bench to amp up the pressure on defense has been near perfect. Zook is locking down the opponents best player and making them work for every shot and point, and he's finding more than his share of offensive rebounds and putbacks on offense. It's just all clicking right now, and a lot of that credit goes to Coach Sly & his staff...they never stopped working with this group. Winning is contagious and I thought every guy on the team played their role extremely well tonight. Excited to see this team give it all they have at the Fieldhouse.